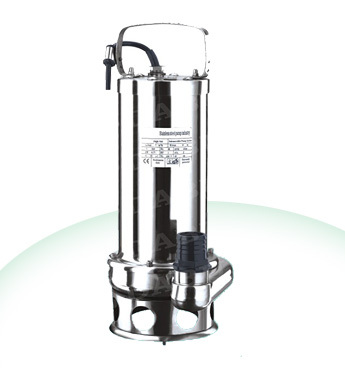 Model GX/GQ is a kind of standing stainless submersible pump whichis founded on ISO 11. The adoption of swiding flow style bottom suction structure and the unique flow passage design provide it with wide dfficient area of the lift and do wnright drainage, suitable for the tran sportation of mine enterprises, construction sites, breed aquatics industry, fluid drug, cfink, seawaterand solids whose diameter is no bigger than 15mm in the general caustic mediums whose physical nature is similar to water. The protector in the motor can auto matically cut off the power when it is overheated or overcurrrented, thus guarantee the security and reliability of pump’s operation even in the atrocious environment. 4.Density of the trans medium limit:1.2x103kg/m3. Copyright©2011-2012 TAIZHOU DABU PUMP CO.,LTD.